Cool, you translated your drawing into 3D! That's crazy, lol. Great job on it, what program did you use to make that? One is 'fake', the other is not, guess which! I don't think it ever loses the tentacles... they're stored inside the psuedo-mandibles, he just didn't bother drawing them in the stages inbetween (since he was focusing on the feet to fin to feet evolution at that time). As for the fins-feet-fins-feet, look at Sea Lions - as fish they had fins, as amphibians/reptiles/mammals they had feet... then they went back to the water and got fins again... Dolphins and Whales are probably too far gone to survive evolution back into land forms, but smaller creatures like Seals and walruses still spend some time on land, and could probably revert back if the environment forced their decendants to. I figure, if the aquatic stage (like 3 steps back or so) still spent a lot of time basking in the sun on shores, it's not so far fetched for them to revert back again. Love to see him describe the habitat and climate of his world that brought about these changes, though. That's a pretty cool creature. I don't know if Spore will give you the ability to put limbs inside the mouth. Good thought, though. By the way, I love your below-avatar-saying, Jaleho. "El Guapo" is Spanish for "The Good-looking one." I think the evolution is designed to force varied gameplay when the creature is actually made. It has them they just sit within the false mouth (psuedo-mandibles). But i did not want to have to draw them every picture. It still has them at all stages after it gets them. I used 3D Sudio Max. And then for the text Adobe Photoshop. Since the beak is the real mouth, and the psuedomandible is sort of an external fake beak or shell, I bet you could just make the psuedomandibles to be something like curved flippers - put a dent in the front of the body, put the beak and tentacles in the center of the dent, then stick two big wide flat curved fins on the rim of the dent. It will work and function just the same (probably). I suspect there will be a lot of experimenting in the editors - even if they add thousands of parts, we will still be able to come up with something they didn't think of, so we can either modify something they DO have to come close, or muck with the code to modify the editor ourselves. Or present maxis with a giant list of add-ons we would be willing to pay for in spore 2 But hey, that's what this forum is about - giving them ideas for what to put in the game, eh? PS: The "Infamous El Guapo" line is from the movie "The Three Amigos"
As you can see it walks on its knuckles. It had or ginally 2 middle fingers and then a thumb on either side. The thumb and finger fused and the closest segment to the knuckle. then the thumb shrunk and the last 2 joints support the weight of the backwards foot. When swimming it can extent out and between the 2 fused finger/thumbs is webbed skin. Normally that webbed part is either walked on or folded up in the knuckle-walking pose. As for the skull you can snow see the true mouth which is the beak. Out of that are the 2 pseudo-mandibles. The bottom is like a shallow cup in which the tentacles (soft tissue like an elephants trunk) can sit in. The upper pseudo-mandible hold a "melon" like a dolphin has in which it can send out echolocation while in the water. 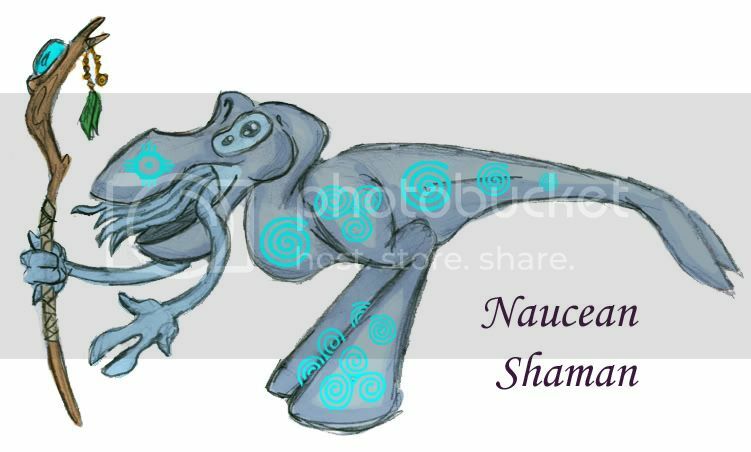 Also like a whale it can produce strange sounds both in its nasal cavity but in the pseudo-mandibles when closed or to amplify its call when open like a mega phone. It has no teeth but digests using a gizzard like birds do. Since its back limbs are gone now all it has it a hip and the pubic bone. Thus it walks on its front legs and not its back like an ostrich. 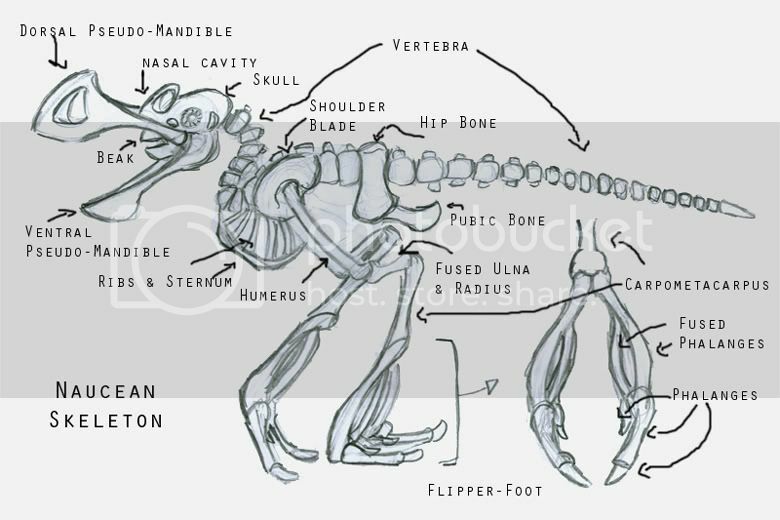 However with its counterbalance shape like a raptor it can run fast but is still limited by its front heavy head like t-rex had to deal with. When swimming it used both its powerful dolphin-like tail as well as using both flipper-feet in a frog-like swimming pattern. It also close its pseudo-mandibles for best hydrodynamic motion. Despite its ability to walk on land it still stays by a water source. Its skin drys out easily and is very much like dolphin skin. It must also carry some water in the lower pseudo-mandible to keep it's oral tentacles wet and useable. The Naucean lays eggs. Even in its whale stage it still came to land like sea turtles and would sit on nests. Unlike sea turtles the males of the colony take turns sitting on the eggs because not all are pregnant at once. They must take turns or the parent will dry out. Nauceans also live in pods of 10 to 20 individuals. Adolescents are raised by the older embers of the pods. Those who are too old to help hunt, fish or gather food. When a Naucean hits puberty they join the other hunters and gatherers. The females are larger and more aggressive. They hunt small game and fish in the ocean. They also are a blander blue-gray color. The males are smaller but do tent to be more colorful. They tend to gather plants, nuts, berries, roots and other non meat items. Males are very intelligent and are constantly curious about how things work. This is one of the key features of the species. The combination of the strength and cunning of the females with the curiosity and creative nature of the males. Mating involves an impressive mating dance by the male. They paint their bodies and open their pseudo-mandible wide showing off their oral tentacles. The tentacles can change colors like a squid. Waving these around while dancing around and making deep whale-like calls is quite impressive. Once impressed the female sits and the male mounts. The gestation takes 6 months and then the egg is laied and is incubated for another 6 months. When the babies are born they are more capable than a human baby they can swim immediately but it take them about a year to learn how to walk. Babies are fed by regurgitating food from the mother's gizzard after her hunting or the fathers after pre-chewing gathered food. Gah! *asplode* Holy crap, 10 points for thoroughness! Where do you get 3-D Studio Max??? Probabably at school. And it probably costs about $1000. If you don't have it somewhere, don't count on buying it.